Spring is the perfect time to clean house. Toxins and stress accumulate over time and lodge within the cells, tissues, and mind, making us feel sluggish, irritable, and in other ways sub par. Lightening up even for one day has profound benefits for the bodymind. The therapies listed here are combined into healing journeys lasting anywhere from 90 minutes to 3 hours. Clients sign up for one or multiple sessions. Here we feature a host of traditional, hard to find, Ayurvedic therapies designed to assist the body in releasing the old and clearing space for the new on physical and subtle levels. These therapies help to detoxify stress from the bodymind too. Included when you sign up are recipes and guidelines to support you in getting the most out of your session(s). If you are doing a cleanse or participating in a group cleanse, then this signature treatment journey is for you. It will profoundly support your body's ability to cleanse on all levels. Whether your cleansing goals are modest or mighty, we are here to support your journey. Schedule a consult if you would like to learn more about cleansing the Ayurvedic way, or simply how to bring more balance into your life through the wisdom of Ayurveda. Garshana, which means 'rubbing', is a dry, vigorous type of massage done with either silk or wool. This treatment targets the lymphatic system under the skin. Repetitive rhythmic strokes create friction and heat, which dilates blood and lymph vessels and enhances the metabolic processes in and under the skin. It also activates and opens the subtle channels, known as 'srotas' in Ayurveda. The friction of the rubbing action creates a kind of static electricity and an alkalizing effect which is cleansing on a physical and energetic level. Dead skin cells are rubbed off and the skin is vitalized. The skin is the largest organ of the body, and one that plays a key role in elimination of waste. Garshana enlivens and supports the health and function of the lymph and skin, and is therefore a great aid when undergoing any kind of cleanse. The Ayurvedic oil massage, known as Abhyanga, is at once stimulating and grounding, activating and nurturing. The oils are chosen for your unique constitution, and contain herbs that ease muscular aches and pains as well as support the flow of lymph. The strokes are generally toward the heart to support venous and lymph movement. Special attention is paid to the head and face, as there are many energy points known as marma points in this region. Activating these points supports many bodily organs and systems and is especially calming to the nervous system. Abhyanga wrings out tensions and toxins while strengthening the muscles, enhancing the immune system, and grounding the mind. Ayurveda works with the five elements of earth, air, fire, water, and ether. These are connected to the five sense organs. So the use of oils, touch, essential oils, healing sounds, all work together to harmonize the bodymind. Nasya is a cleansing treatment for the nose and sinuses in which oils are administered and sniffed deeply into the sinus cavities. This simple yet deeply detoxifying treatment moisturizes the nose and sinuses, reduces inflammation, cleanses and clears pathogens from the sinuses and head, nourishes the brain, and opens up all the pathways which carry the physical and subtle breath. A warm compress is first placed over the face to help open the sinuses. 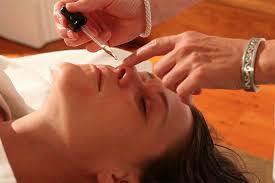 Herbal oil drops are then administered and marma points activated to further open the channels and balance the mind. Integrated into your session are Marma Point techniques I learned from Dr. Vasant Lad at the Ayurvedic Institute, and Polarity Therapy techniques I learned taking John Chitty's Polarity Therapy Course. These modalities complement one another seamlessly, as Polarity Therapy is actually influenced deeply by Ayurveda's principles of the five elements. These techniques profoundly balance the nervous and energy systems of the bodymind. When I check in with clients a day or two after the treatment, about what stood out for them, many say it was the work done on the face and head. In Ayurveda, the mind can be accessed and treated through the skin, the senses, and especially, the marma points. Your cleansing journey continues with a deeply penetrating herbal steam. The steam moisturizes the lungs and entire body while opening up the pores so that the oils and herbs can go in, and toxins can go out. The blood and lymph vessels dilate significantly, and toxins literally 'melt' so that they can be more easily mobilized for release. This treatment does wonders for the muscles. It reduces muscular aches and pains, speeds tissue repair, and increases range of motion, all while supporting your body's cleansing process. While you are steaming, a cold towel is placed over your head and face, as well as heart area, to keep your core areas from overheating. This keeps the nervous system settled and allows you to relax into the treatment more deeply. Shiro means head. Dhara means to flow. Shirodhara is the crown jewel of Ayurvedic therapies. It both cleanses and deeply balances the nervous system, senses, brain, and mind. 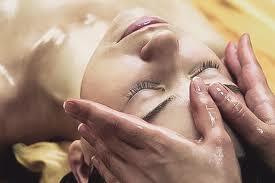 During a Shirodhara treatment, herbal oil flows in a steady stream across the forehead and crown for 20-30 minutes. The oil stream is steady and constant, like a gentle fountain. It slowly moves side to side balancing the hemispheres and brainwaves and guiding the awareness deeply within. Subtle tensions and toxins are swept off the body, allowing the nervous system and energy system to re-organize into a more balanced, functional, and resilient state. Benefits are varied and profound: healthier sleep patterns, reduced stress, enhanced cognition, perception, vision, and intuition, more clarity and joy. Best wishes on your journey to balance, health, and happiness.